RDs know how powerful nutrition therapy can be for managing diabetes and lowering the risk of its associated long-term complications. Since type 2 diabetes is characterized by elevated blood sugar levels caused by impaired insulin sensitivity, eventually accompanied by insufficient pancreatic insulin production, it seems intuitive that controlling dietary carbohydrates, the main nutrient that directly influences glycemia, would be a logical dietary approach for diabetes management. For that reason, low-carbohydrate diets have constituted the standard treatment for type 2 diabetes for centuries. Since the advent of insulin-sensitizing drugs and oral hypoglycemic agents, however, nutritional guidelines have evolved and the current diet for diabetes now is relatively high in carbohydrates. But could some patients and clients with type 2 diabetes benefit from adopting a lower-carbohydrate approach? There’s no consensus on the definition of a low-carb diet. This is why looking at the methodology of different scientific studies always is important to understand exactly what kind of low-carb diet was investigated, which can vary anywhere between 45% to less than 5% of its calories from carbs. Most researchers with experience in the field of low-carb diets usually base their studies on diets providing between 30 and 100 g of carbohydrates per day accompanied with a moderate amount of protein (15% to 30% of calories), with fats providing the rest of the daily energy requirements. In concrete terms, a typical low-carb diet would include some form of animal protein at each meal with nonstarchy vegetables and fat from sources such as olive oil, avocado, nuts, butter, and cheese. Participants usually are instructed to avoid or severely restrict grains, sugars, legumes, starchy vegetables, and fruits to keep their carb count within the established target range. A typical day may include a cheesy broccoli omelet with sausages for breakfast, a chicken salad with a low-carb salad dressing for lunch, grilled salmon with nonstarchy vegetables stir-fried in coconut oil for dinner, and almonds, olives, and cheese as snacks. Many studies indicate that low-carb diets can be beneficial for weight loss, especially in individuals with type 2 diabetes suffering from insulin resistance and blood sugar dysregulation, as previously acknowledged by the ADA. For example, a study conducted at Duke University Medical Center compared a low-carb ketogenic diet (fewer than 20 g of carbs daily) and a low-glycemic diet (restricting calories by 500 per day) in obese subjects with type 2 diabetes.2 At the end of the 24 weeks, the low-carb group lost an average of 24.5 lbs compared with 15.2 lbs in the low-glycemic group. What’s noteworthy about this study is that only the low-glycemic group members were instructed to restrict their calories, while the low-carb group had to limit only their daily carb intake but could eat fats and animal foods to satiety. Another study published in the January 2008 issue of the American Journal of Clinical Nutrition using an ad libitum crossover design confirmed this hypothesis. The researchers showed that subjects who were obese felt more satiated and spontaneously decreased their calorie intake when fed meals providing fewer carbs and more protein and fat (4% carbs and 66% fat on the low-carb diet vs. 35% carbs and 35% fat on the moderate-carb diet). These findings could be the missing link to help individuals with type 2 diabetes reduce their calorie intake and lose weight without hunger. The Duke study also showed potential of low-carb diets to optimize glycemic control.2 Although both diets in the study resulted in significant improvements, hemoglobin A1c decreased more in the low-carb group compared with the low-glycemic group (-1.5% vs. -0.5%), independent of weight loss. Within the study period, almost all subjects in the low-carb group (95.2%) reduced or eliminated their diabetes medications compared with only 62% in the low-glycemic group. Patients with type 2 diabetes are two to four times more likely to suffer from heart disease or stroke.4 One main concern most RDs have with low-carb diets is their obviously higher fat content. Fortunately, studies seem to indicate that a higher-fat diet, even if rich in saturated fats, may not be a problem in the context of carb-restricted diets. A meta-analysis published in the November 2012 issue of Obesity Reviews looking at all clinical trials investigating the effects of low-carb diets on cardiovascular risk factors supported the safety of low-carb diets for heart health. Data from 1,141 obese patients, some with type 2 diabetes, showed that following a low-carb diet for anywhere from three to 36 months resulted in significant improvements in waist circumference, blood pressure, triglycerides, fasting glycemia, A1c, insulin levels, and C-reactive protein levels as well as an increase in heart-protective HDL cholesterol. No significant changes were observed in LDL cholesterol and creatinine levels. These results appeared to be consistent across most low-carb studies. Despite their higher total and saturated fat content, individuals following a carb-restricted diet tend to benefit from lower triglycerides, higher HDL cholesterol, lower C-reactive protein levels, and better glycemic control, which all translate to a lower risk of cardiovascular diseases. Total LDL cholesterol values usually remain unchanged, but their size usually shifts from the small and dense atherogenic pattern B to the more harmless, large and fluffy pattern A, as explained by Jeff S. Volek, PhD, RD, in the August 2005 issue of Nutrition & Metabolism. Another larger long-term study published in the August 2010 issue of the Annals of Internal Medicine involving 307 participants compared the effects of a low-carb diet and a low-fat, calorie-restricted diet after two years. The results showed that although weight loss was comparable in both groups, the low-carb group benefited from greater reductions in blood pressure and triglycerides and larger increases in their HDL cholesterol. Kidney health also shouldn’t be a concern for most individuals with type 2 diabetes with normal renal function. It’s important to remember that the low-carb diets studied in the scientific literature aren’t necessarily high-protein diets but rather higher-fat diets. In addition, a promising study published in the April 2011 issue of PLoS One using an animal model showed that a low-carb ketogenic diet may improve or even reverse diabetic nephropathy. Dietitians now can offer low-carb diets as an option for their clients with type 2 diabetes, helping them focus on nutrient-rich foods to ensure nutritional adequacy. Working in concert with physicians also is important to allow timely adjustments of medications, especially insulin, oral hypoglycemic agents, and hypotensive medications, and the regular monitoring of the health risk profile. 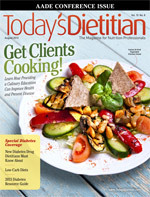 — Aglaée Jacob, MS, RD, CDE, specializes in diabetes education and digestive health. She’s the author of Digestive Health With REAL Food and is currently studying naturopathic medicine in Toronto. 1. American Diabetes Association, Bantle JP, Wylie-Rosett J, et al. Nutrition recommendations and interventions for diabetes: a position statement of the American Diabetes Association. Diabetes Care. 2008;31 Suppl 1:S61-S78. 2. Westman EC, Yancy WS Jr, Mavropoulos JC, Marquart M, McDuffie JR. The effect of a low-carbohydrate, ketogenic diet versus a low-glycemic index diet on glycemic control in type 2 diabetes. Nutr Metab (Lond). 2008;5:36. 3. Lindeberg S, Jönsson T, Granfeldt Y, et al. A Palaeolithic diet improves glucose tolerance more than a Mediterranean-like diet in individuals with ischaemic heart disease. Diabetologia. 2007;50(9):1795-1807. 4. Centers for Disease Control and Prevention. National Diabetes Fact Sheet: National Estimates and General Information on Diabetes and Prediabetes in the United States, 2011. Atlanta, GA: Centers for Disease Control and Prevention; 2011. 5. Nielsen JV, Joensson EA. Low-carbohydrate diet in type 2 diabetes: stable improvements of bodyweight and glycemic control during 44 months follow-up. Nutr Metab. 2008;5:14-19.